“The Act Of Killing” also arrives this Friday, a more complex labyrinth of violence than the Refn film. This documentary takes us to the streets of Indonesia, where long ago there was a battle for the region’s soul, and the gangsters won. Mob-sanctioned killers who participated in ethnic cleansing now walk the streets like common folk, their crimes so far in the rear view that recollection of such feels like sepia-tinged nostalgia. Never punished, never policed, they have come to feel as if they have done the right thing, that their wave of murder (many casually suggest they have killed hundreds, and it feels accurate) has been justified. Produced by Werner Herzog and Errol Morris, this fascinating doc first seems as if it’s going to probe the memories of these men, searching for some sort of evidence of guilt as to explain the existence of a conscience (or lack thereof). The curious decision the picture opts for instead is inspired by western thought: these men are going to star in a film about their exploits, playing themselves carrying out these murders to purify their land. It’s only then when suddenly the rise of guilt doesn’t occur, but the idea of questioning the past happens. A “private” police force who had a hand in the massacre agrees to lend real-life members of the group, but when they shoot a scene of post-violent celebration, their leader orders a stop to the filming; they wouldn’t have celebrated violence so enthusiastically back then, it would have been “tasteless.” “The Act Of Killing” is a mesmerizing doc, one that will haunt you long after you’ve left the theater, and most assuredly a must-see, a tonic to this year’s onslaught of blockbusters that have consistently trivialized the idea of death. That bully, who has led me to pick fights with the likes of Mark Duplass, fortunately vanished, and I was able to experience one of the year’s most delightful pictures. 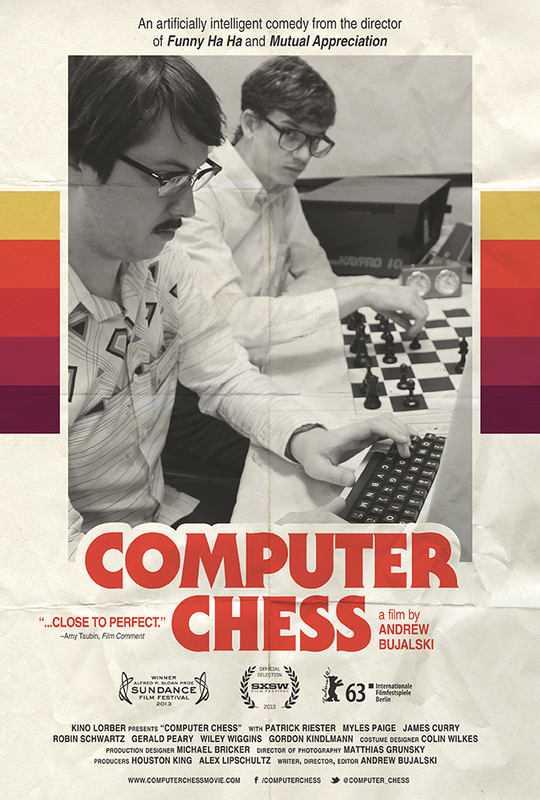 What’s not said in “Computer Chess,” which is thoroughly dedicated to its period trappings, is how these unassuming young lads (and one lady, as the event’s host repeatedly, awkwardly reminds everyone) are creating the blueprint for artificial intelligence in the late nineties onto today, the building blocks of our everyday community. Not every one of these characters is a “nerd” in the Robert Carradine sense, though there’s no shortage of social dysfunction. One, a heavy-set, lisping British participant, holds court over the perfect amount of hard liquor to drink when programming code. Another wanders the halls of the motel, refusing to admit to anyone he was too broke to actually book a room, and uncomfortably propositioning the lone female just so he can have somewhere to sleep. A sweaty, blustery interloper, the lone “groupie” of the weekend, knows very little about the technology on display, but has several Cold War theories as to where it all might lead, and many joints to share. Each one of these people are fascinating to observe, as they gawkily interrupt each other, start fights, and spread rumors about the military reps who are watching over their backs that never really materialize. This is one of those weekends where you could vote with your dollars if you’re in the appropriate area. The four Hollywood films don’t seem like great bets for success, but who knows? It will make a difference if there are some viewers out there, however, who take a chance and vote for their dollars, vote for three of the year’s most fascinating films, to break the monotony of theaters packed with the latest hot-season drivel designed to placate and numb you into submission. Please choose wisely. But ZOMG am I so psyched for "Only God Forgives". And another one coming out soon is "The World's End" (rather sooner for me than for you guys in the US, but before the end of August in either case). The relatively close release of "This Is The End" which seems to have the exact same premise (i.e. end of the world comedy) might cause a problem. However, the appeal of Simon Pegg and Nick Frost is very strong, especially over here in the UK. If given the choice between Seth Rogen or Simon Pegg, the verdict will always lean a lot more strongly to the latter over here. I think it might be worth easing off on the whole "the end is nigh" rhetoric. The demise of cinema is often greatly exaggerated and these days this is particularly true in your articles. Sure, most of the films being released are pants, but 99% of ANYTHING is pants. Is Computer Chess definitely being released in the US this summer? There's no release date according to IMDB. Just some festival releases. I do remember quite a while ago now hearing a recommendation for a different documentary about Chess on the Mark Kermode and Simon Mayo podcast. I believe they were referring to a movie called "Brooklyn Castle". Are you familiar with it? I'm interested to see "The Act of Killing" but if you decide to make a film that is intensely disturbing and about real life, I feel I'm probably better off with the option to "pause" if things get tough. Mark Kermode hopes for a trend towards more intelligent blockbuster movies, arguing that they are the safest investment for studios and that therefore there should be more experimentation in the content. (The rule being that if you make the enormous amount of money spent on the film obvious to the intended audience both on the screen and in the marketing, if you have an A-list star and, to be safe, make sure the movie is not a comedy, you are pretty much guaranteed to make your money back.) Kermode feels that "Inception" is a good example of a more thoughtful and intelligent blockbuster movie and surely in that sense "Elysium" is following in its footprints. How intelligent it turns out to be is still to be seen. Ceetainly it was very obvious that Blomkampf's previous movie "District 9" was a massively over-extended run of an intelligent short, with some special effects items from the ditched "Halo" movie shoved into the third act for good measure, so "Elysium" will be Blomkampf's true baptism by fire as a director. Are you optimistic, sceptical, or pessimistic on "Elysium"?